My second Iceland trip with Kuku Campers! What’s the best way to see Iceland? 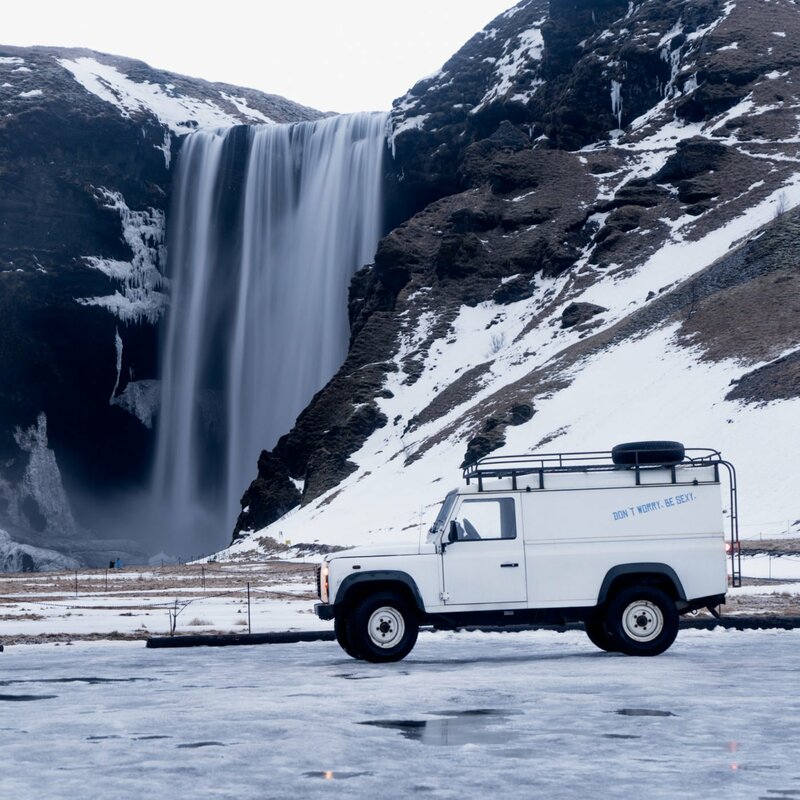 For my second trip to Iceland in a campervan, I teamed up with Kuku Campers again and rented their Land Rover Defender campervan. You have to be a little Kuku to rent a campervan and basically sleep in a car during winter! Actually not really, it’s still your best option if you don’t have your trip planned to the max but still want to see as much of the beautiful country as possible! When I arrived at the airport I immediately noticed the weather was a bit rough. These was going to be a hell of a week. A girl from Kuku Campers was waiting for me at the airport and soon enough we were on our way to Reykjavik. 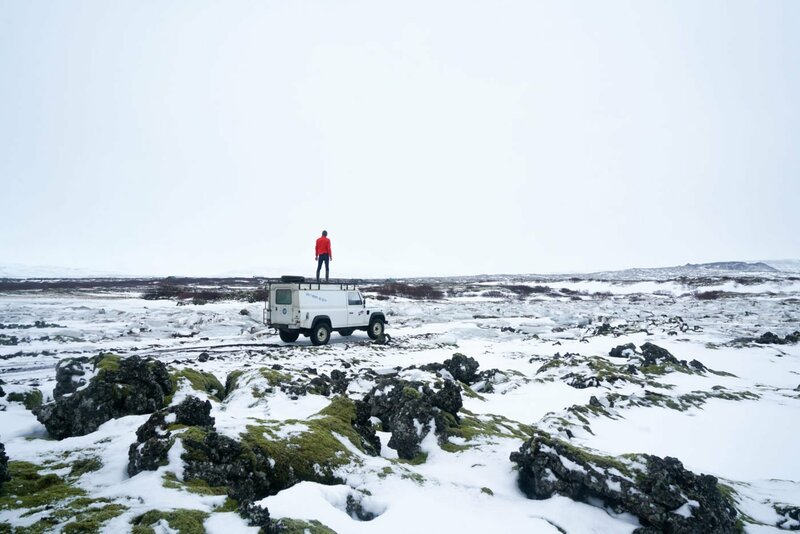 Kuku Campers doesn’t have an airport office but they can pick you up and drive you to their Reykjavik office. You can still drop the car off at a parking lot near the airport though, which is quite convenient! This gives you a lot of freedom on your last day. You don’t have to be at the car rental office by a certain time, and you don’t have to worry catching your bus transfer from Reykjavik Center back to the airport. Basically you don’t lose half of your last day in Iceland. I took the opportunity to discover the Reykjanes peninsula. Most of the people visiting Iceland only see the highway from Keflavik airport to the capital Reykjavik. Or they just visit the Blue Lagoon during a short layover, which is one of the tourist traps to avoid in Iceland. First things first, I needed a name for this Kuku Campers Defender. The one I had a couple of months ago went by the name of Ricky. I figured that name fit his playful but stubborn handling. The one I had now was Ricky’s smoother brother, which I named (very originally)… Rocky! With 220.000 km on the counter, I was confident this car knew every road in Iceland by heart, haha. 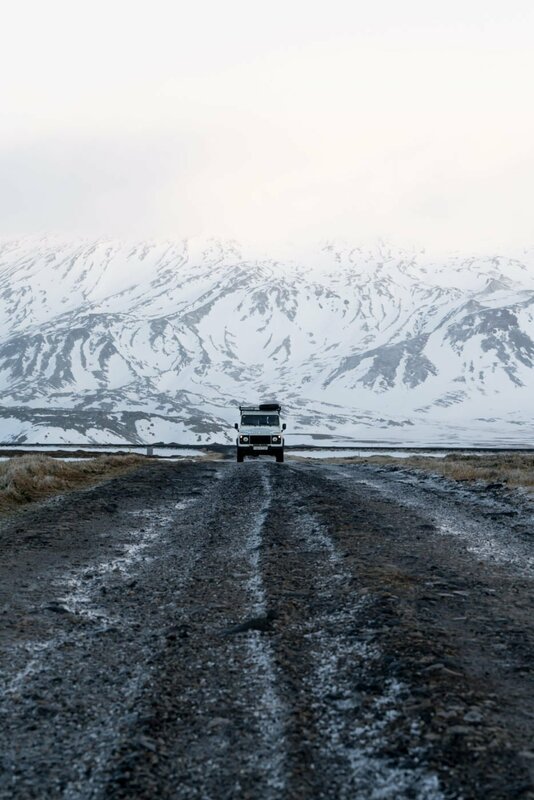 Apart from snow, the beach is one of the few places in Iceland where it’s allowed to really drive off-road. The tides will wash away the tracks. So I followed the beach for some kilometres before I switched back to the road! 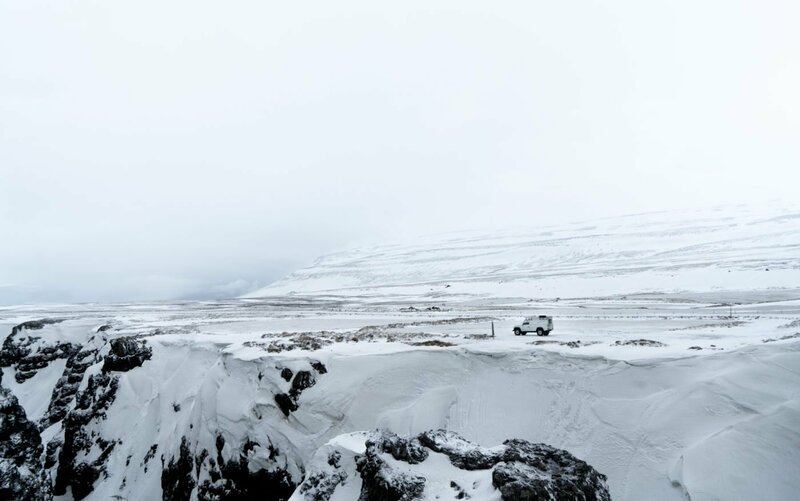 Whoever says it’s not necessary to rent a 4×4 vehicle in winter in Iceland because you’d only be driving the ring road anyway is absolutely wrong! It’s difficult enough with the heavy Defender, I wouldn’t dare thinking of driving in a Chevrolet Spark here… the wind will blow you right off the road. 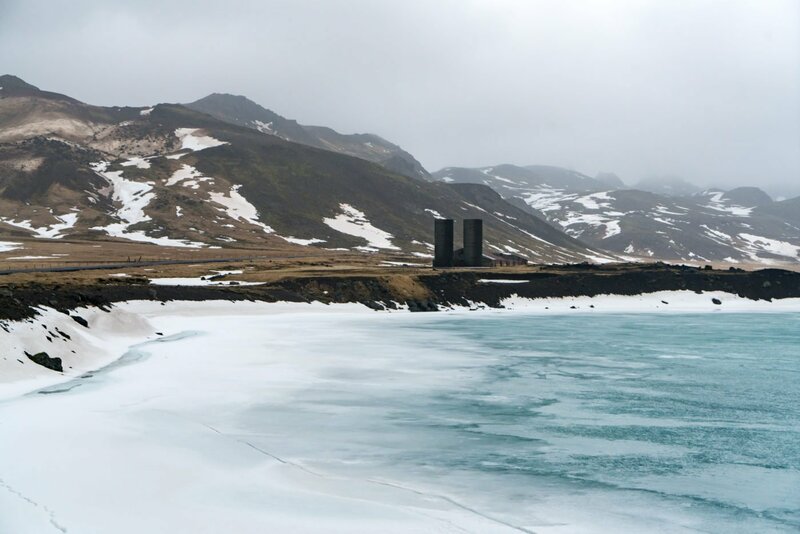 I know some of you live in tropical countries and have never seen snow in real life (I’m jealous), let alone you’ve experienced the harsh driving conditions like you will in Iceland. So by all means, rent a heavy 4×4 and you’ll be good. The Kuku Campers Defender I had really succeeds in combining the best of both worlds. Firstly it’s obviously a campervan, so you don’t have to worry about getting to your hotel at a certain time. Room in the back of the car is more spacious than you would have guessed. I’m 188cm tall (6’2ish) and I can lie down fully stretched. There’s room for two if you know each other or you want to get to know each other. This time, I was traveling solo so it felt absolutely luxurious back there. On one side they created a cabinet to put stuff in and the vehicle comes with a cooler, cooking utensils and cutlery. If you’re wondering how I managed to sleep in this car for a week during one of the toughest weeks of this Icelandic winter… Well I’m not so badass as you think. There’s actually a heater with a separate battery inside, giving heat for up to 10 hours. During the day, it recharges while driving. Kuku Campers got your back. At the end of this road, there is a secret hot pot. 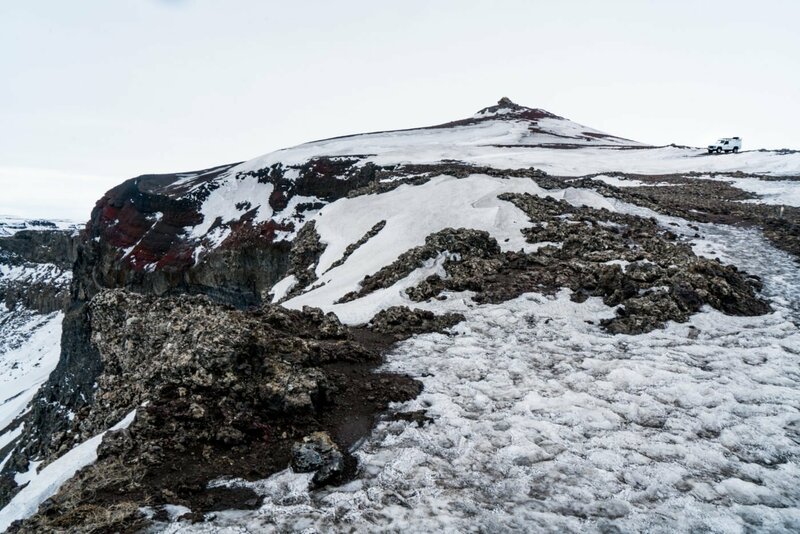 I got there back in summer, but now, the road was blocked by huge chunks of ice! What appeared to be a very wild river had run across the road and then froze completely. 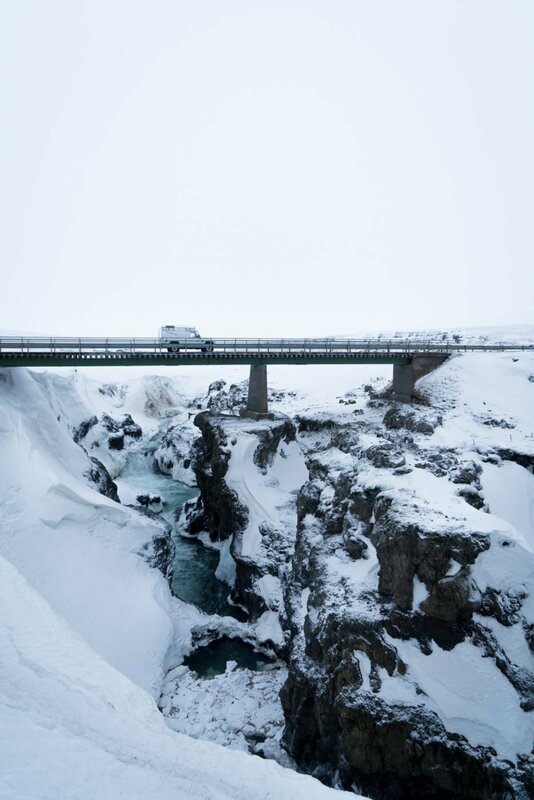 An example of some of the extreme circumstances you’ll come across in Iceland. Needless to say I didn’t make it to the hot pot! On the outside, the camper looks like any other regular Defender, an aspect I really like. You can just pull up on a parking lot and sleep there without being noticed. All the Defenders from Kuku Campers are white, some have the grid on top and some have the spare wheel at the back, but that’s basically the only difference. Secondly, it’s a 4×4. During summer, this means there are no limits to where you can go. This bad boy can tackle the hardest of F-roads in Iceland. 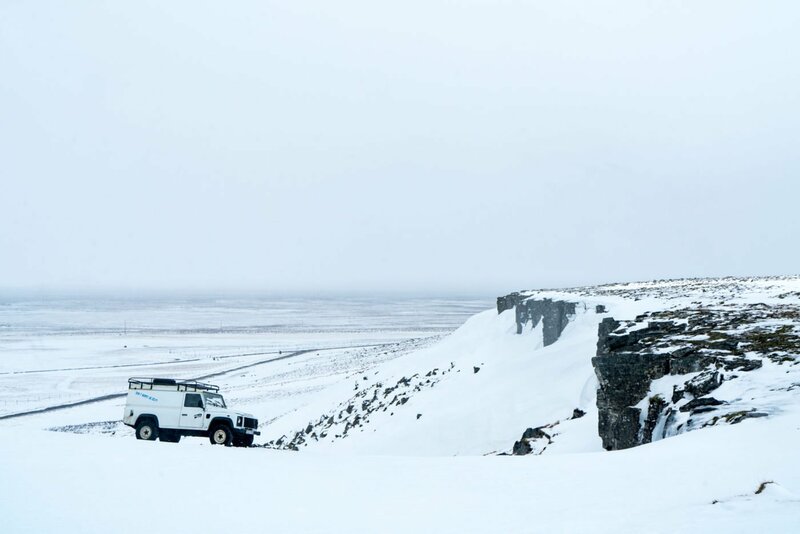 In winter, the weight of the vehicle and the 4wd-ability definitely helps you staying on the road when a sudden snow storm hits you. The car has big studded winter tyres, so you can still drive a decent speed on snowy roads (as long as you remain careful!). Having been in Iceland during summer, I skipped the Golden Circle and headed straight to Skogafoss. The sun was setting when I got there and it was immediately clear how few tourists visit Iceland in winter. This really set the tone for the entire upcoming trip: I was at what is probably Iceland’s best-known waterfall and there was literally no one there. I parked Rocky all the way at the back of the parking area, as close to the waterfall as possible. This was going to be my first night back in Iceland in 6 months and I got to spend it at a magical place in Iceland thanks to Kuku Campers. I can’t remember every place where I slept, but they all had one thing in common: I was there all by myself. It’s obvious that I’m a huge fan of Kuku Campers. If I weren’t happy the first time then I wouldn’t have rented with them a second time. 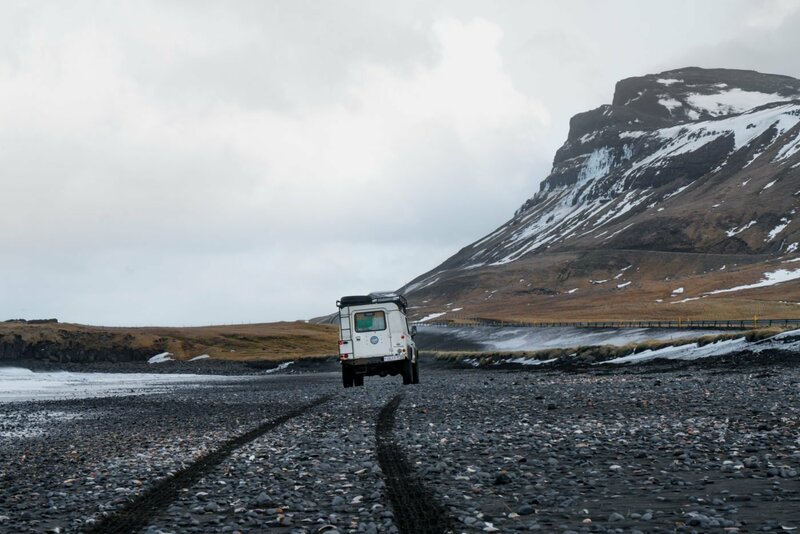 I vouch for them and I’m 100% certain my second road trip wouldn’t have been such a mind-blowing experience without the Land Rover Defender from Kuku Campers. 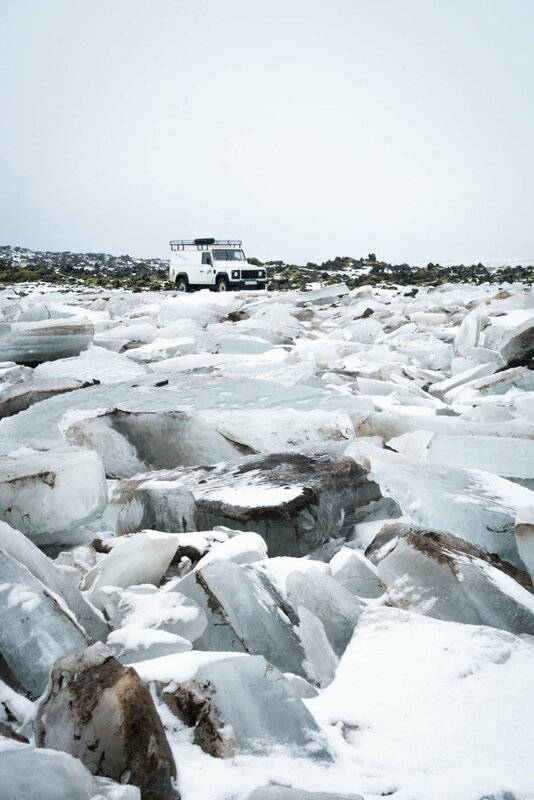 Even though I slept in hotels too during both of my trips in Iceland, I feel like the Defender from Kuku Campers is the best option for traveling in Iceland with a campervan. If you aren’t convinced my all my talking, here’s a few more pics of what I did and where I went! 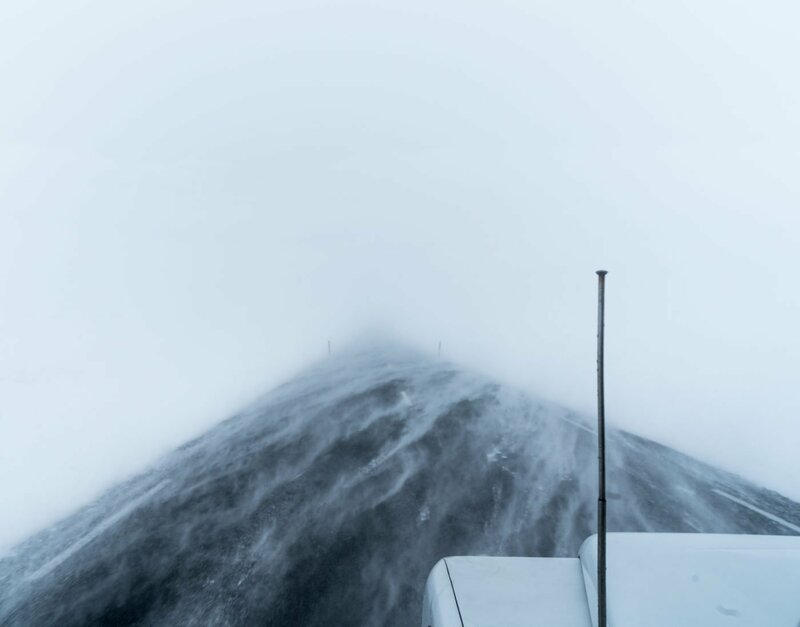 The road to Ytri-Raudamelur in Snaefellsnes peninsula was too snowy for normal cars so Gerduberg cliffs were hard to reach, but not for trusty old Rocky! Find Rocky! Here I drove right to the edge of Jökulságljúfur canyon, the valley that is home to Hafragilsfoss and the better-known Dettifoss. To get to this point, I had to drive over snow for some kilometres, but it was well worth it. I sat there for 2 hours overlooking the canyon!